As a courtesy, we here at the Truth Team are asking everybody to please abide by the wishes of a candidate running for office: let's only talk about what he/she is currently saying. Let's take Stephen Colbert's lead and zip our lips and forget about on any past/current actions. Please?!? Come on, guys. Please?!?! We mean...it is Valentine's Day, right? Well..The politician in this case is Bob Grogan. The DuPage County Auditor and the World's Most Interesting Accountant has come out with a statement about his intentions if he were to win the race for Illinois Treasurer. He says that the 'Treasurer's office is not a stepping-stone". Republican candidate for state treasurer Bob Grogan said that if he’s elected, he won’t use the office as a “way station” en route to a higher office. The current state treasurer, Republican Dan Rutherford, is running for governor. 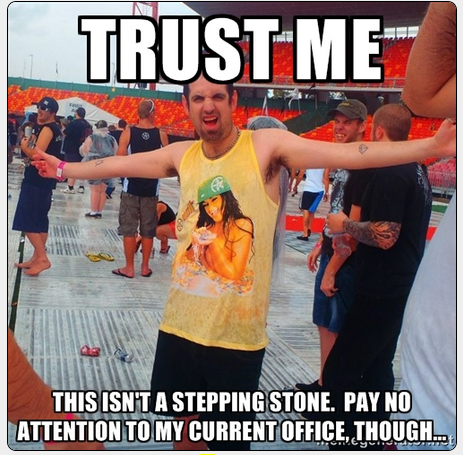 Being treasurer “is neither a consolation prize nor a stepping stone. The problem? It was pointed out by a comment on the story: How can we take Bob Grogan seriously if he's doing EXACTLY what he is saying he won't do with his current job? Guess walking away from the DuPage County Auditor's office (after having a really poor performance track record vs. other similar County Officers not to mention the fact that he has a hard time showing up for work regularly) shouldn't matter to what he's saying. That's a tough one, isn't it? Can we trust a politician who is saying something that is contrary to his current actions? Politicians are famous for 'saying things just to get elected'. Seems like one of those times, doesn't it?